I think you’re now very aware of our passion for fresh produce. We shop almost daily, grow as much as we can in our raised veggie beds, and we source much of the rest from our local greengrocer, or right across the road at Nauset Farms. 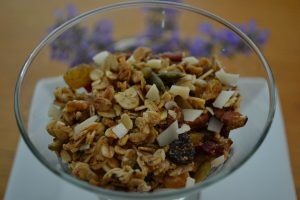 Our guests are constantly asking for the recipes and in particular for Jo’s homemade granola. So after some very careful consideration, she has decided to “spill the beans”. It has evolved over the last couple of years as we have strived to make that perfect combination of healthy and tasty!. It’s really an easy recipe to prepare, so here we go. Heat the oven to 300f. Melt the coconut oil and maple syrup in a sauspan and stir . Mix all the ingredients except the dried fruit in a large bowl. Add the melted syrup to the bowl and mix well to coat the ingredients. Spread the ingredients on parchment paper on a large baking tray. Bake for 30 – 40 minutes, the smell is delicious! Remove and allow to cool. Add the remaining dried fruit, crunch everything up, fill your air tight container and enjoy. We enjoyed this when we stayed at the Inn. Coconut oil is very good for you. Thanks for the recipe! We are a family owned and operated maple sugaring business in Vermont. Would you be interested in using our maple syrup to make your granola? The current wholesale price is $40/gallon. Please have a look at our website, sillowaymaple.com, to learn about us. We use solar power, and wood fire!